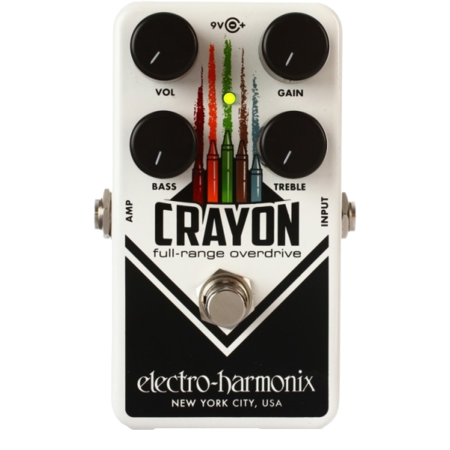 Electro-harmonix have added to their healthy stable of pedals with something a bit more simplistic. This drive pedal is meant not to focus on the mid rage as many drive pedals do, but rather to have a more full tonal spectrum available to the user. While it does suffer from a dash of the common stuffiness of many drive pedals, this “full-range” stompbox does give you a nice selection of tonal colors. A simple four knob setup for a drive pedal. The bass knob has a particularly good and nicely manipulable effect on the sound. Not overly broad in its spectrum of tones, but it can easily achieve subtle drive to biting distortion with a few stops along the way. This pedal does quite well with your tone. As with many overdrive pedals, there can be an element of stuffiness, but with this pedal’s eq knobs, that can be avoided. There is some nice organic warmth to this pedal. Although it is not the best we have seen, this in a not a bad pedal to use in your effects setup. There is enough manipulability and warmth of tone to make it useful and a positive addition to your signal chain. Product info from the EHX website.